Camel milk, which is slightly saltier than regular (caw’s) milk, is rich in vitamins B and C (5 times higher in Vitamin C than cow’s milk) and has 10 times more iron than cow’s milk (growth and blood supporting properties). It is also very rich in potassium (the important element to support heart and nerve functions), phosphorus, calcium (excellent for pregnancy), protein (250 g contains the same amount of protein as in an egg), and lower fat content (1.8 to 2% as opposed to 4.5 to 5%) than cow’s milk. It is, however, rich in non-saturated fatty acids. This will probably help reduce cholesterol issues. The content of Vitamin C in Camel’s milk is almost 5 times higher than in Caw’s according to research analysis. There is also plenty of probiotics (healthy bacteria) found in camel’s milk. Even though camel milk contains lactose – a sugar found in milk products, but it does not cause allergic reactions in people with lactose intolerance. Therefore, it is considered an alternative for people with dairy intolerances. Interestingly, came’s milk does also show liver-strengthening properties of the wild herbs preferred by camels such as rosemary, thyme, wormwood, and southernwood. The problem with caw’s milk today is that it is almost not real any more since the majority of the Caw’s milk products available at the supermarkets are supplied by mass production facilities which use mainly corn and bone powders to feed the castles. Depending on the local standards, antibiotics and stimulating hormones are also used on the cattle that reflect back to the consumers and would easily compromise our health including triggering lots of allergies! At least, when it comes to camels, they still live in their natural habitat and are fed naturally! In general, camel’s milk stays fresh much longer than cow’s milk and in times of drought, the camel continues to lactate long after goats, sheep, and cows have stopped. A lactating camel can produce 4 to twelve kilos of milk a day for 9 to eighteen months. Its composition is closer to human milk than cow’s milk and therefore, it is easier to digest than cow’s milk. 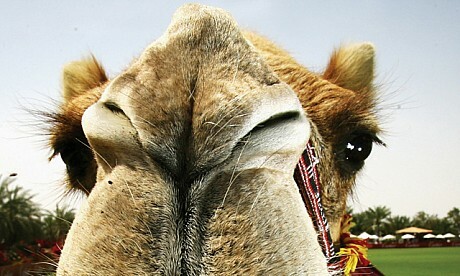 Camel’s milk contains antibodies, and these may help fight serious diseases (immunity). Health benefits of camel milk are attributed to presence of high concentration of insulin-like protein and other factors that have a positive effect on health. Therefore, it can reduce insulin need in diabetics. The fact that camel’s milk does not coagulate easily in an acidic environment (e.g. in the stomach), it makes it available for absorption in the intestines and consequently, this improves the effects of its insulin-like activity.
. The anti-diabetic action of camel milk has been attributed to the camel’s choice of grazing/browsing on natural vegetation in the desert, including salty herbs and plants as mentioned earlier, some medicinal plants with affinity for liver. The regular consumption of camel’s milk would contribute to diabetic management (of course in an adjunct to the routine diabetic management) in maintaining long term blood sugar control in diabetic type 1. It has positive effect in controlling high blood pressure, and helps in the management of arteriosclerosis and osteoporosis. There are also antibacterial and antiviral factors in the camel’s milk, so it improves recovery from infectious diseases.